If Mukden sought to reflect the battles of the past, the five-month Siege of Port Arthur anticipated the future of war. The Siege of Port Arthur, as China’s Lyushunkou District was then known, proved to be iconoclastic. Here, more than a decade before the Somme, the futility of frontal assaults against dug-in troops supported by artillery and machine guns was established. The Russian troops worked constantly to improve their fortifications. While modest trench systems were factors in the battles of Liaoyang and Mukden, at Port Arthur more than 75 kilometers of trench work was dug by both sides, some of it protected by barbed wire entanglements and electric fences. Searchlights helped the Russians fend off Japanese night assaults. To overcome these defenses, the Japanese resorted to tunneling under Russian fortifications. Much of the trenches and defensive works dug by the Russians focused on defending the highest point within their perimeter, a site known as 203 Meter Hill. When the Japanese commander of the besieging Third Army, General Maresuke Nogi realized the outcrop’s importance, he concentrated Japanese efforts on seizing it. The defense of the area stretched from September to December. To seize the position the Japanese sustained as many as 14,000 casualties, while the Russian defenders lost perhaps 5,000. Not until the Battle of Verdun in 1916 would so many lives be traded for such a small piece of real estate. In fact, all Japanese assaults on Port Arthur failed, save when morale not firepower was the deciding factor. 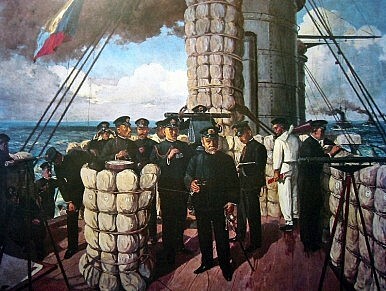 According to The Russo-Japanese War in Global Perspective, an edited volume on the conflict, while the Battle of Sedan had inflicted a Prussian casualty rate of 7.3 percent and the French casualty rate of 18.9 percent, Japanese casualty rates at the Battle of Mukden reached 27.2 percent. The carnage was even higher during the Siege of Port Arthur, in which Japanese Imperial forces suffered a casualty rate of 45.6 percent. Major General Anatoly Stessel’s decision to surrender his force of 33,000 soldiers and seamen despite adequate supplies shocked both the Japanese and Russian commands equally. In World War I, few entrenched forces the size of the Port Arthur Garrison would be surrounded. Prior to the surrender the Japanese had gained control of commanding heights such as the 203 Meter Hill. From there, newly imported Krupps howitzers with 11-inch (280 mm) howitzers bombarded the Russian fleet with 500 pound shells, destroying it piecemeal. The last remnant of the Russian Pacific Fleet and survivor of the Battle of the Yellow Sea was the battleship Sevastopol. Scuttled in deep water just after the surrender, the Sevastopol was the only Russian battleship to not later be refloated by the Japanese; it rests in the same place to this day.